Last week I got an unexpected package from Adam, of the blog Infield Fly Rule. Adam and I have traded in the past and so Adam know what I like and he did not disappoint. 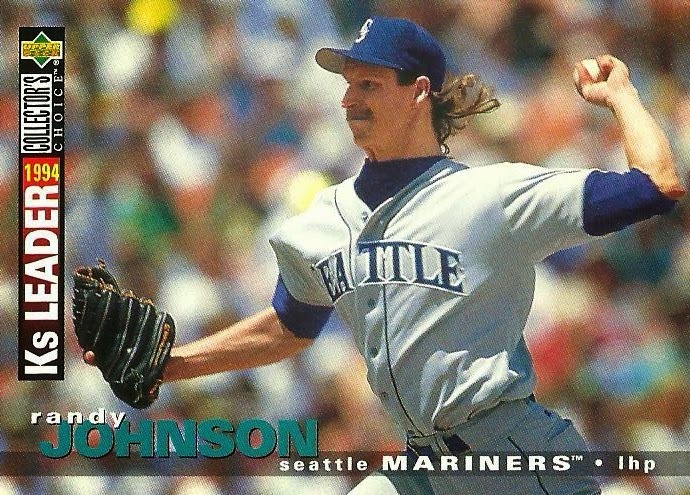 He sent some fantastic cards of former D-Backs in other uniforms, technology cards, D-Backs cameo cards, and a card of Griffey Jr. Sadly, none of these will be shown in this post because he sent so many other awesome cards! Thanks Adam! 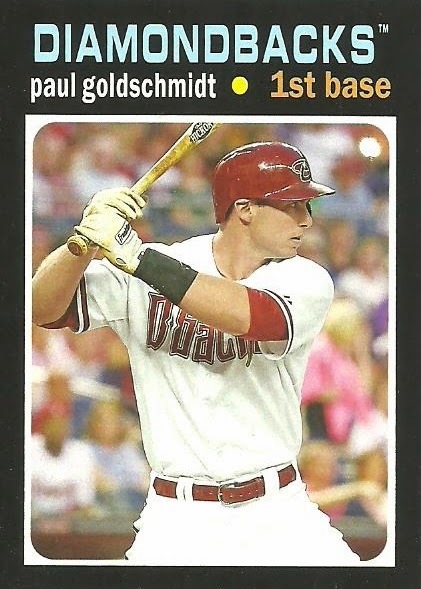 There weren't a ton of D-Backs in the package, but this is a nice Goldschmidt that I don't think I already have. 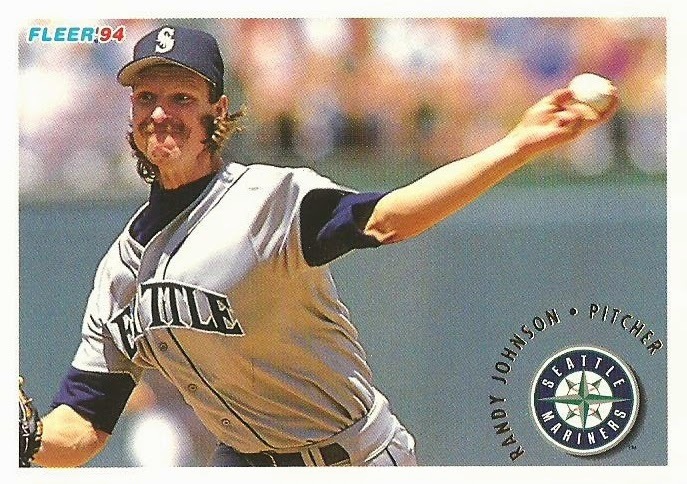 Here is another D-Back card of Randy Johnson. 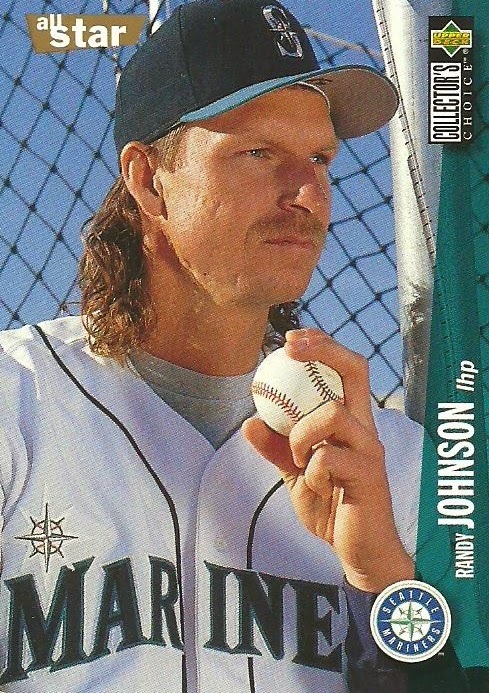 The only card of Randy Johnson in a Diamondbacks uniform that Adam sent, but certainly not the only card of Randy Johnson that Adam sent. 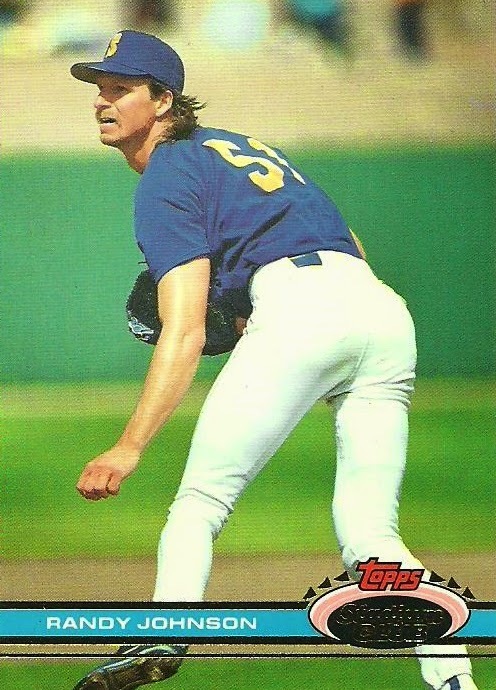 ...a rookie card of him as an Expo! 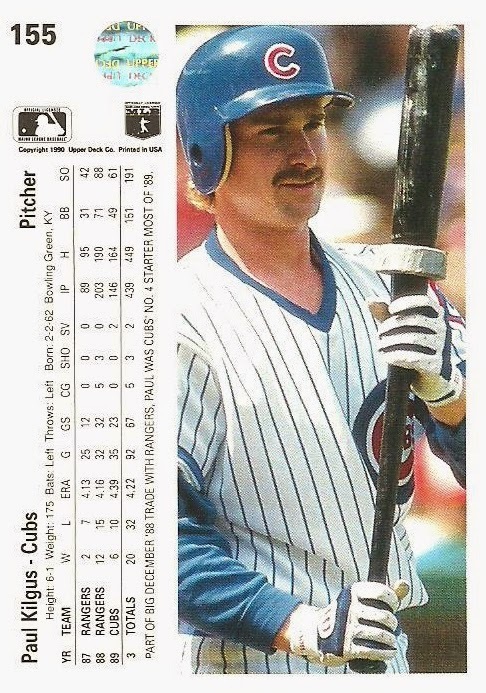 There were a ton of "dirt" cards. Here are just a few. And last, but not least. Donuts...mmmm,,,donuts. 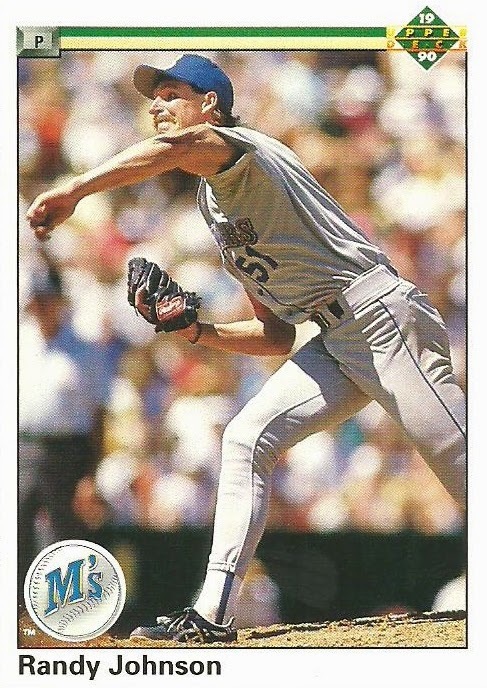 Some were on the front of the card and some were on the back, including this one of pitcher Paul Kilgus. Thanks Adam! I'll get some cards ready to send your way soon! 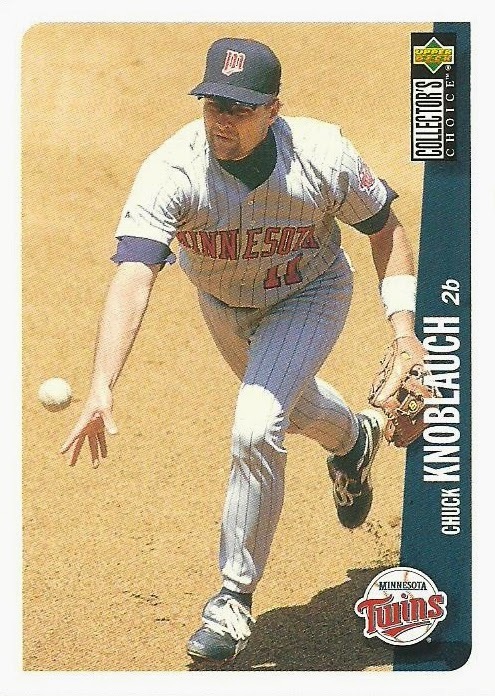 Nick, of the blog Dime Box Heroes, sent me some 2015 Topps cards I needed for my set. Thank you very much Nick! 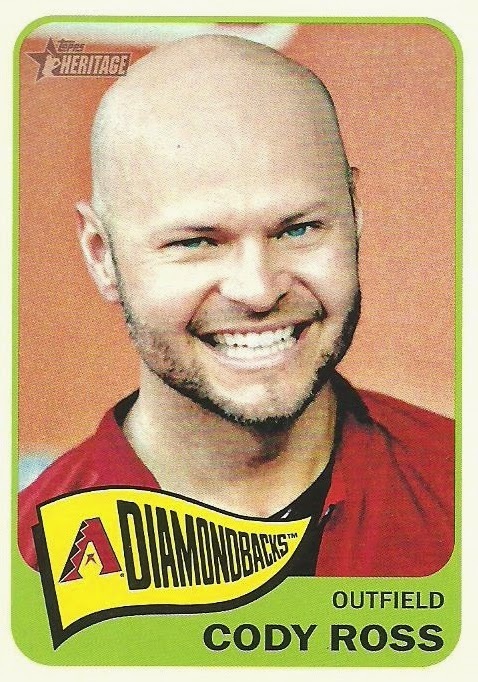 He also included some Diamondbacks cards as well. Here are a few of my favorites. 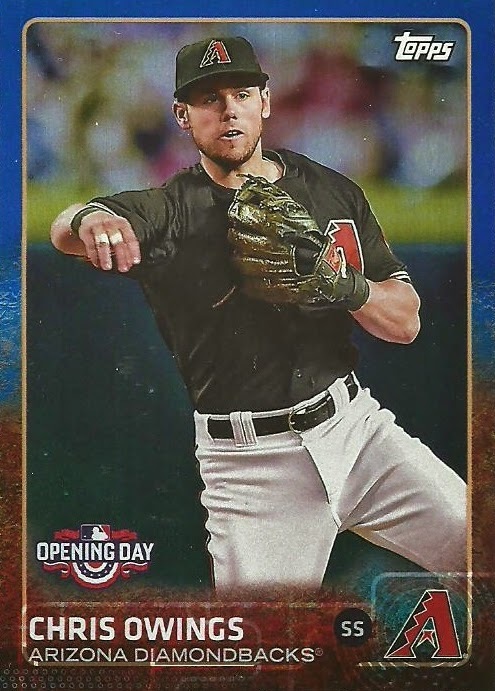 Here are two cards from 2015 Opening Day. 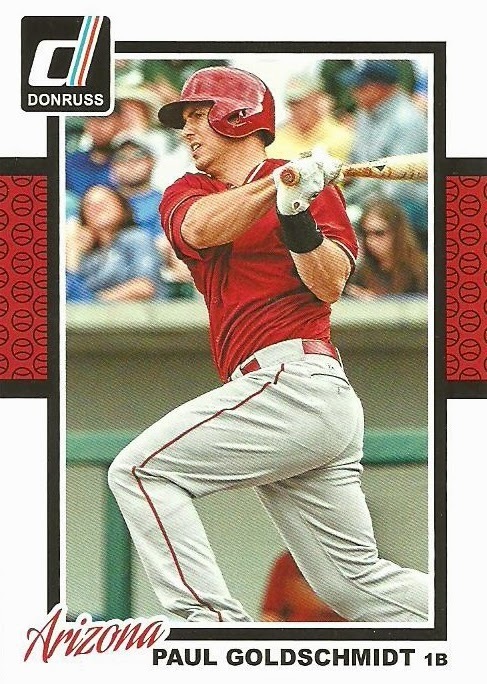 I'm disappointed as well that the parallels aren't numbered this year, but it's still a nice looking card! 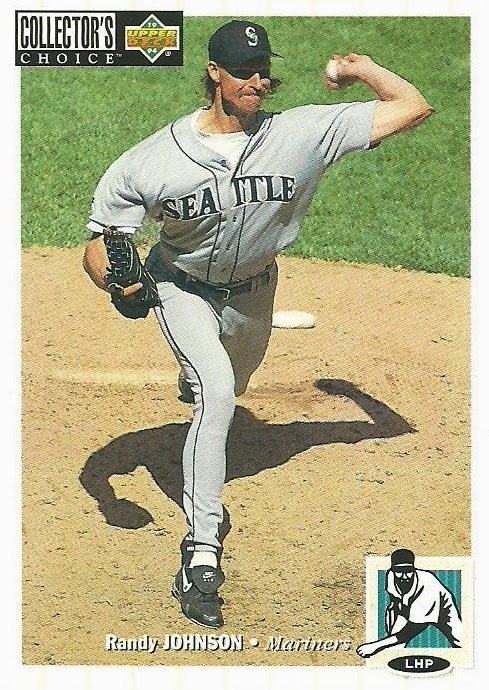 Here's a nice Gonzo inset! 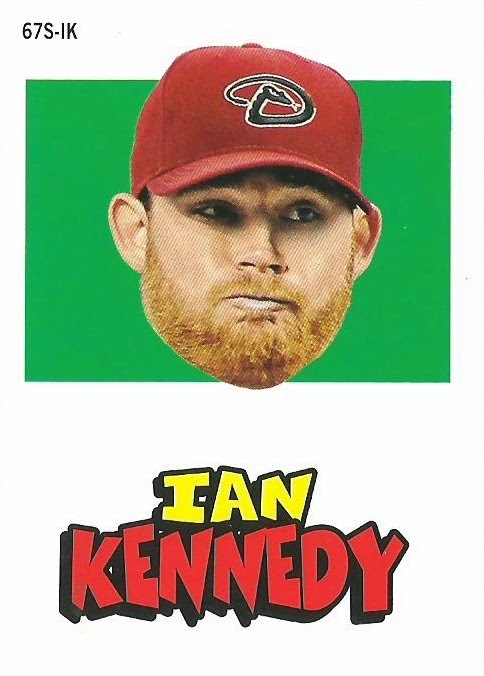 Let's finish off with a couple of Ian Kennedy cards! Thanks again Nick! I really appreciate the cards! An unexpected package from Night Owl! I got another unexpected package in the mail today...this time from Night Owl. Thanks Greg! 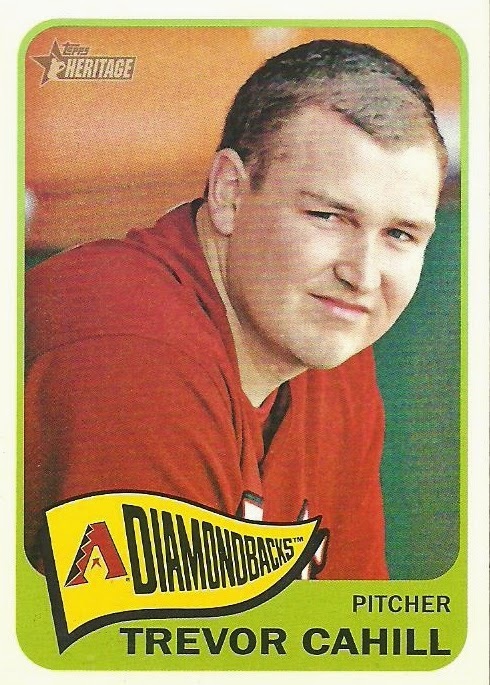 Most of you know that Greg is a Dodgers fan and as such he has a hate for the Diamondbacks! 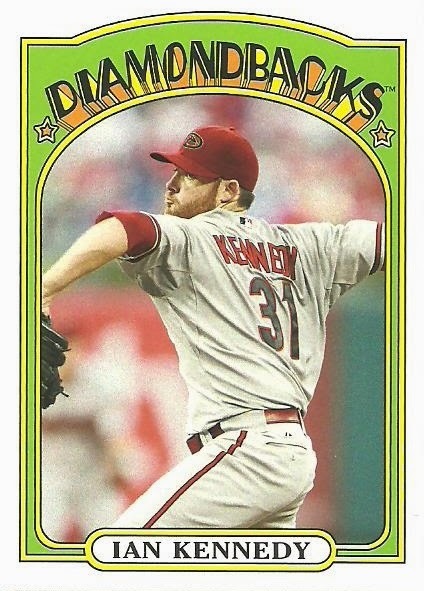 The good thing about that is that he likes to get rid of all his Diamondbacks cards by sending them to me! Check out what Greg sent! 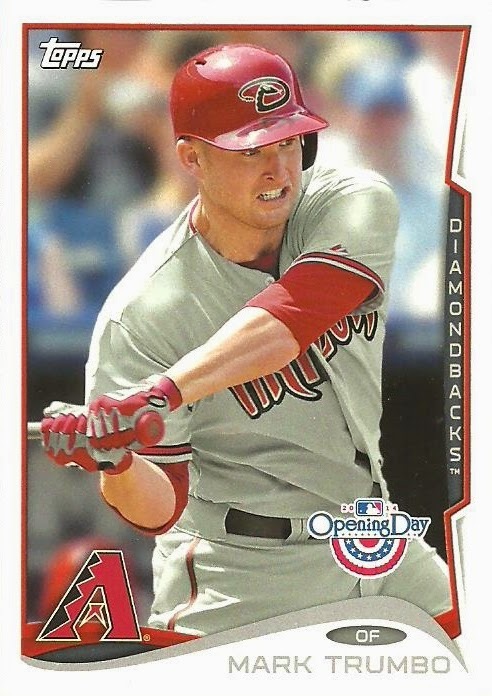 2014 Topps Opening Day Mark Trumbo - 2015 Opening Day came out this week. I haven't gotten any yet. Greg has though. 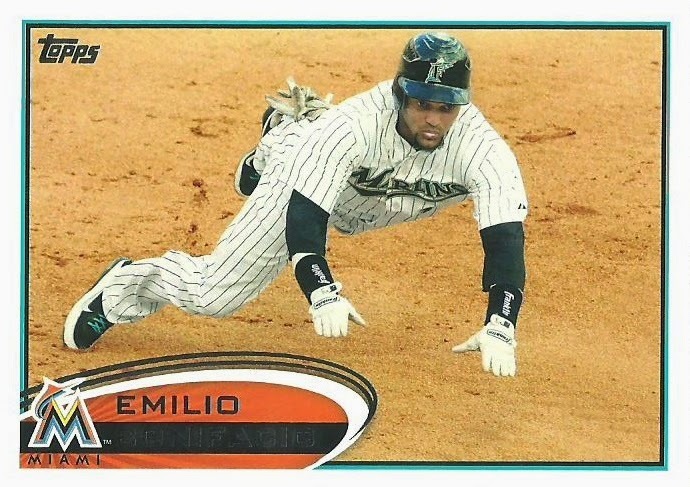 The base is pretty much the same as regular Topps, but they always have cool inserts! 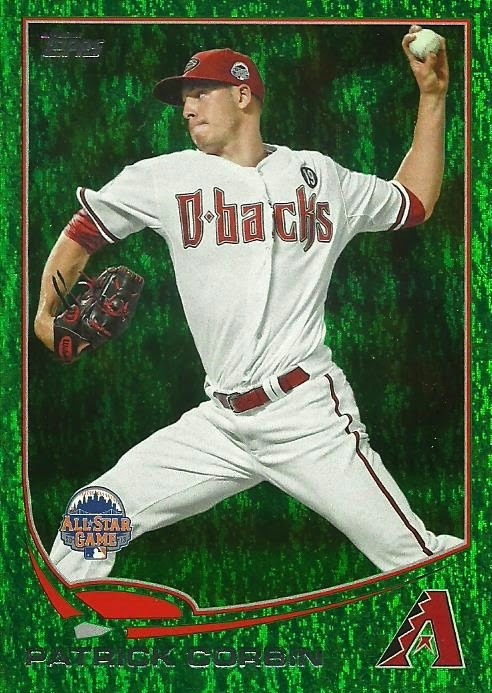 2013 Emerald parallel of Patrick Corbin. 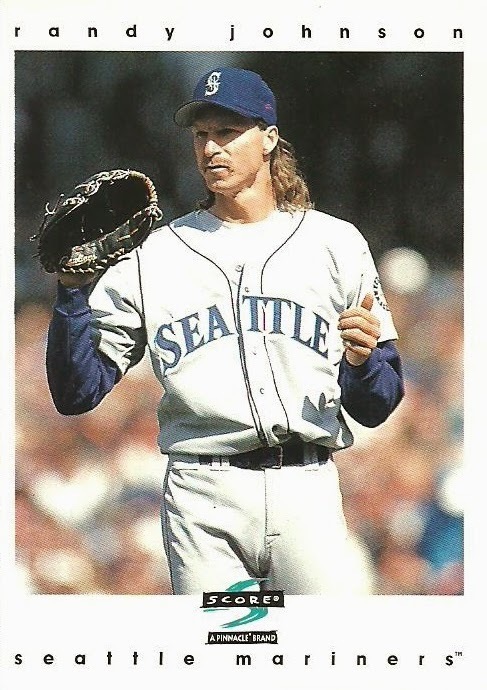 This features the 19 patch which I've mentioned before. On June 30, 2013 a wildfire near the small town of Yarnell, Arizona overran and killed 19 firefighters from Prescott, Arizona. I was at the Diamondbacks game that the 19 patch debuted and they held a moment of silence for those who lost their lives. 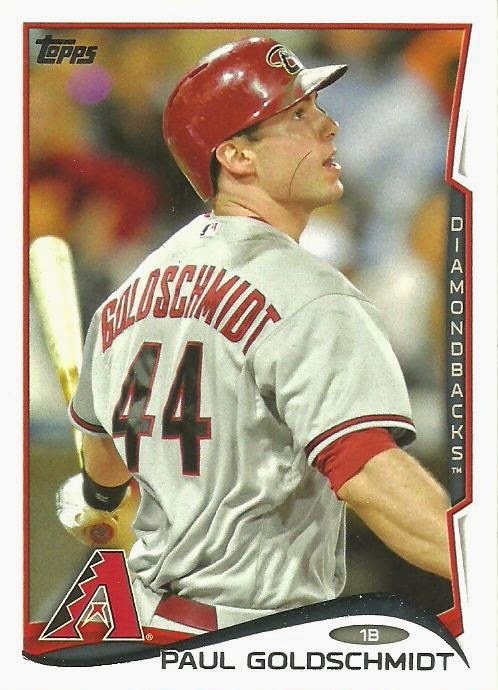 The back of this Goldschmidt card talks about his love of finance. 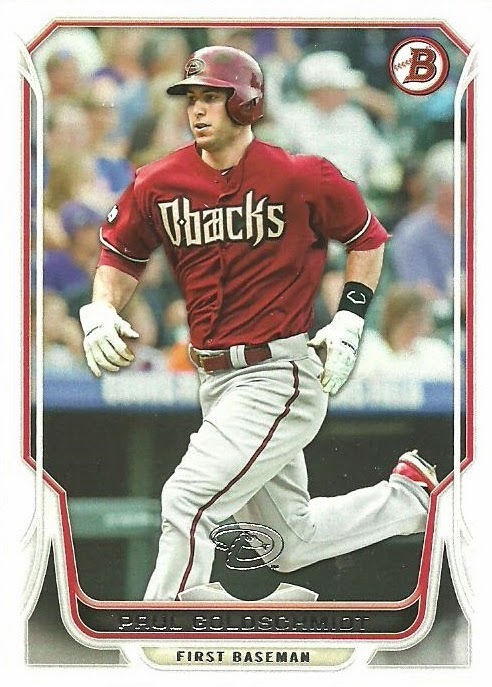 Goldy actually completed his Bachelors degree in September of 2013 at the University of Phoenix. 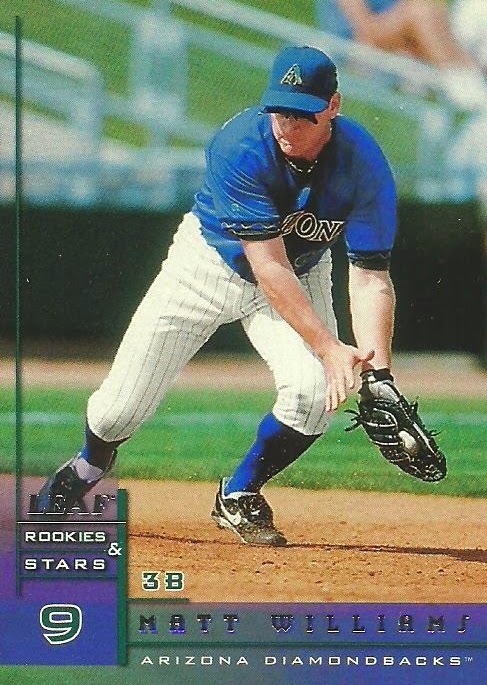 1998 Leaf Rookies & Stars Matt Williams - Williams was not a rookie in 1998. he had been in the big leagues for 10 seasons and was a star for the Diamondbacks in their inaugural season. 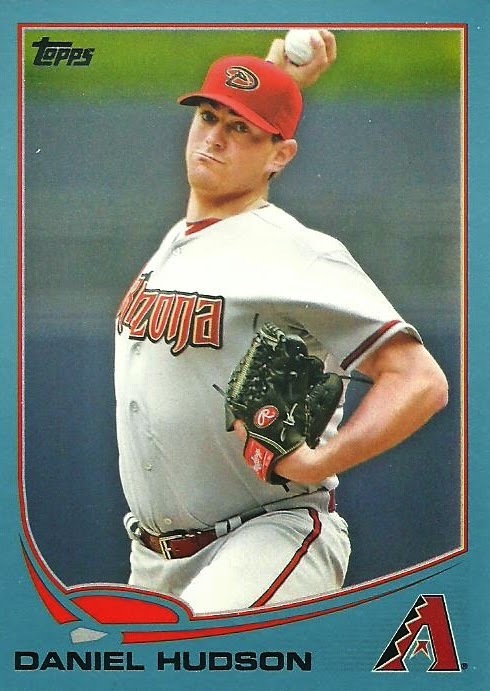 Next up are two Daniel Hudson parallels. The red is from Target and the Blue is from Wal-Mart. We have a Target within walking distance and a Wal-Mart a few minute drive away. If I had to choose, I'd say I prefer Wal-Mart because I think they are cheaper. 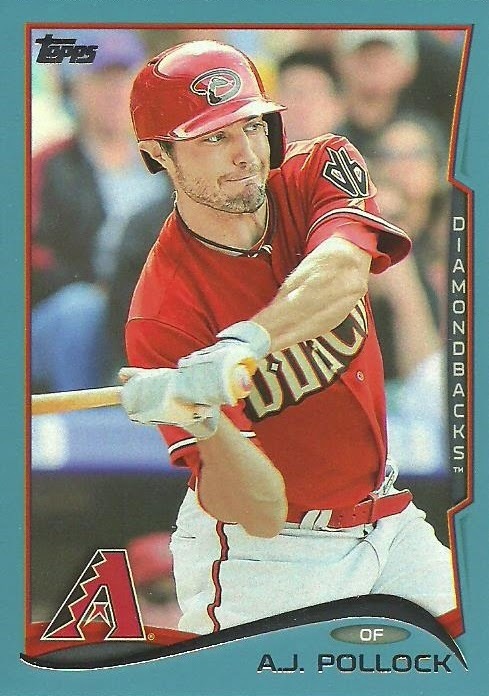 Here's another blue Wal-Mart parallel of AJ Pollock. 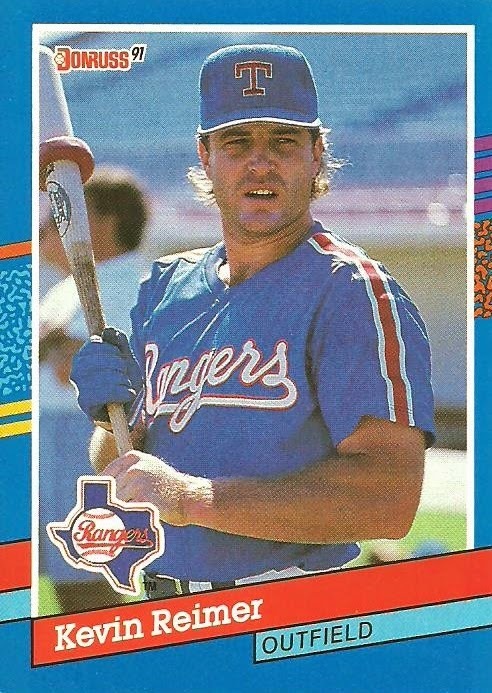 Looks like Greg prefers Wal-Mart as well. 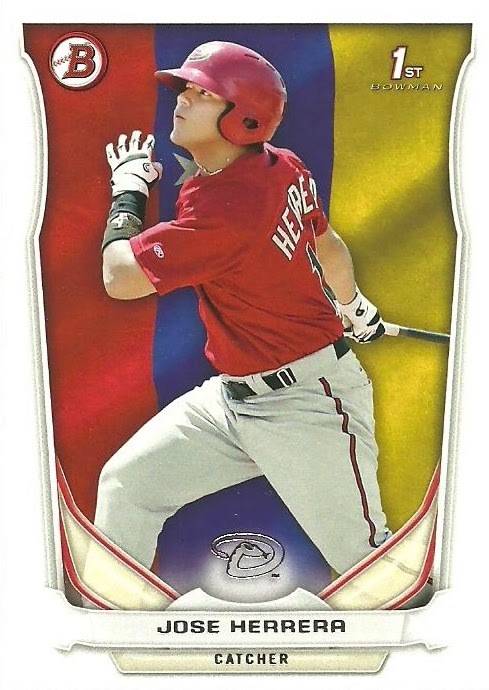 Here's a cool country flag parallel of Jose Herrera. 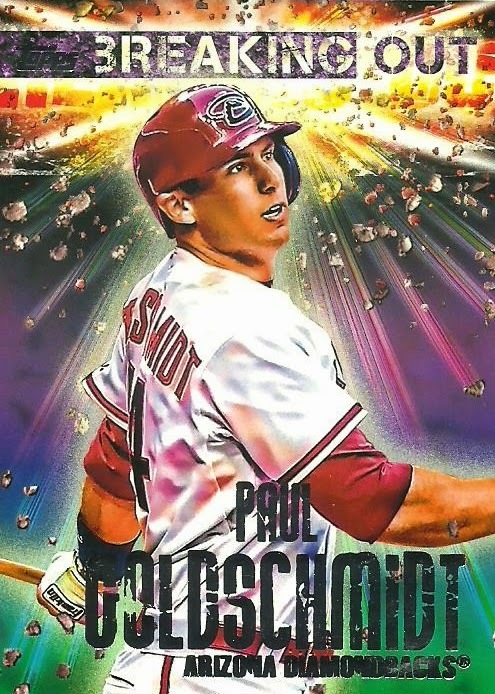 Not sure how much hobby love there is for Topps Stars, but I actually like it. 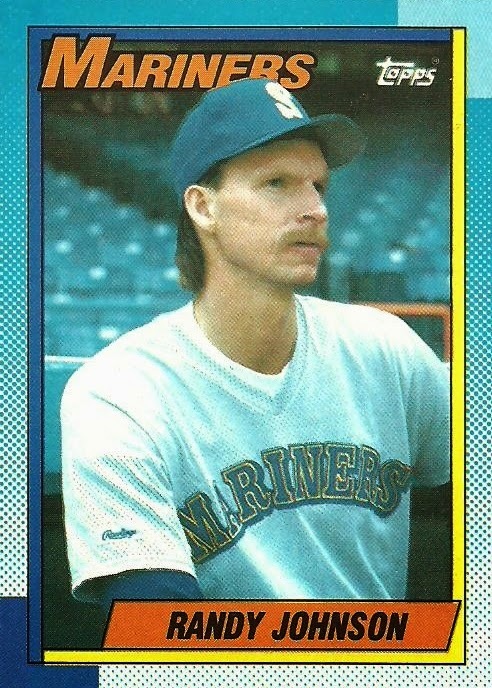 Sometimes I forget how long Opening Day has been around. This is from 2003. 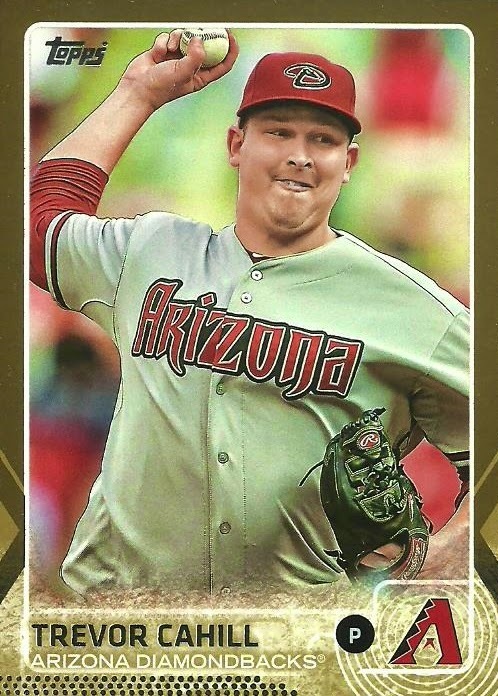 Finally, a 2015 gold parallel numbered to 2015 of Trevor Cahill. 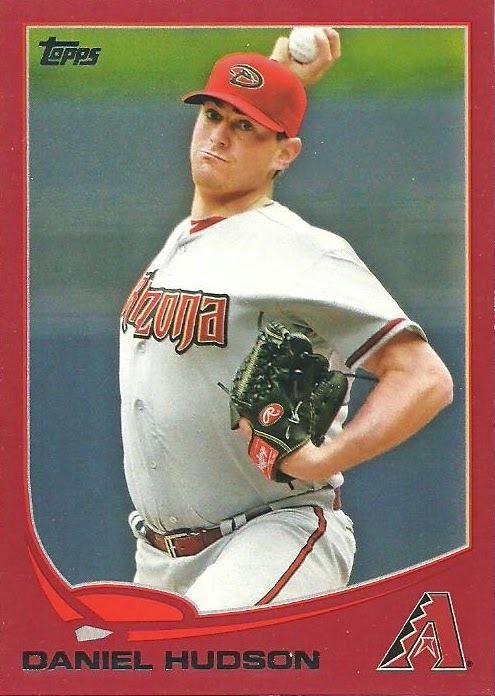 Cahill was 3-12 last season with a 5.61 ERA, so I hope he has a bounce back season. The other day I got an unexpected package in the mail from Jeff, of the blog 2 x 3 Heroes. 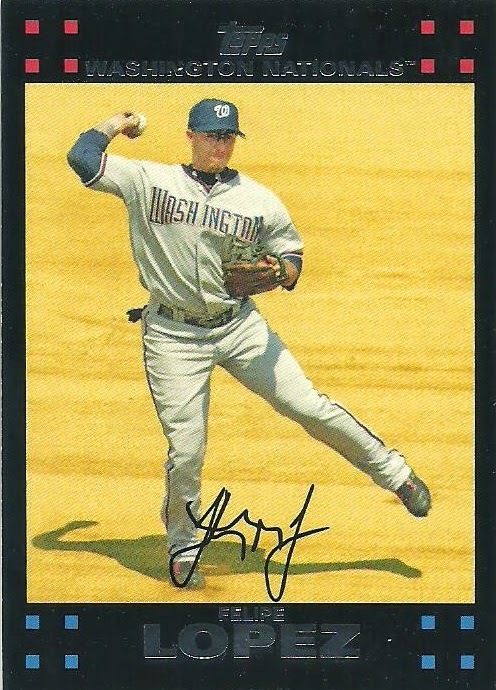 Jeff is one of the most generous bloggers out there and a little while back he offered up some cards and I was one of those lucky enough to get some of them. Thank you so much Jeff! 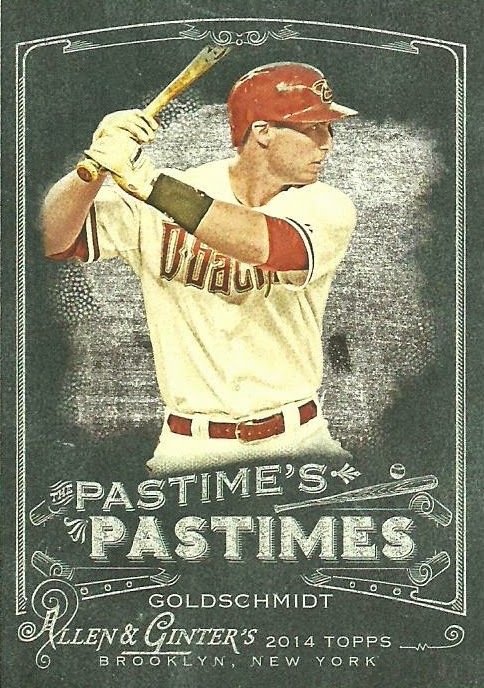 I got a huge stack (I think there were 6 team bags) of 2014 Topps Heritage. They are all in order and include a great variety of players including stars. 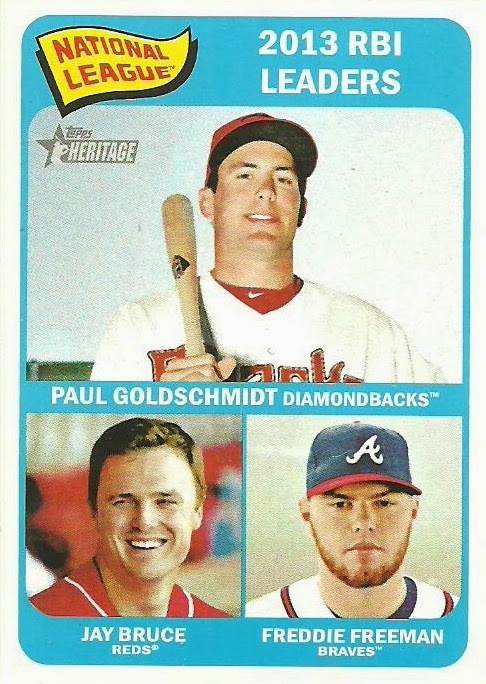 There were 8 D-Backs cards (not counting the Goldschmidt LL card) and only 3 are still on the 2015 roster. I'm either going to try to complete the set or use them for ttms. Not sure yet, but thank you Jeff! 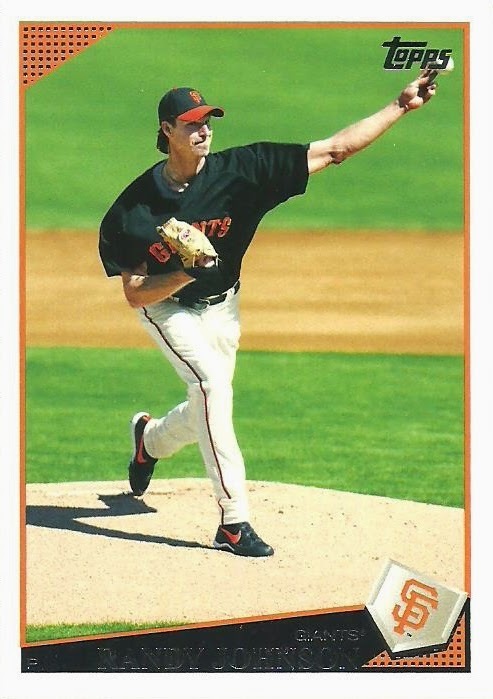 I had also asked about this card for a friend of mine, so this will be coming your way Joe. 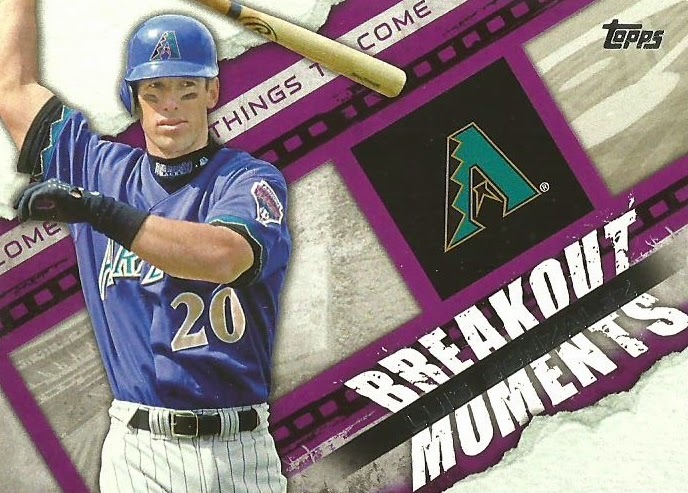 Jeff included a bunch of other D-Backs cards including a ton of Goldschmidt cards. My 60th different D-Backs bobblehead! 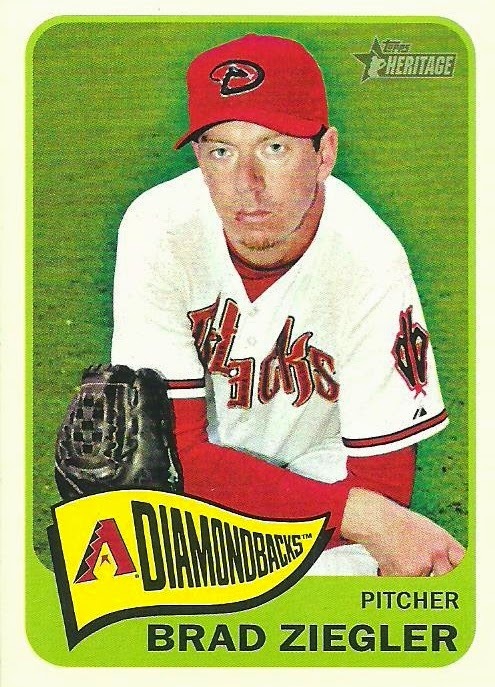 Last Saturday I picked up a 2003 Baxter bobblehead and that put me only needing 3 more D-Backs bobbleheads for my collection. On Monday I was looking around ebay and decided to pull the trigger on one of the remaining bobbleheads I needed. 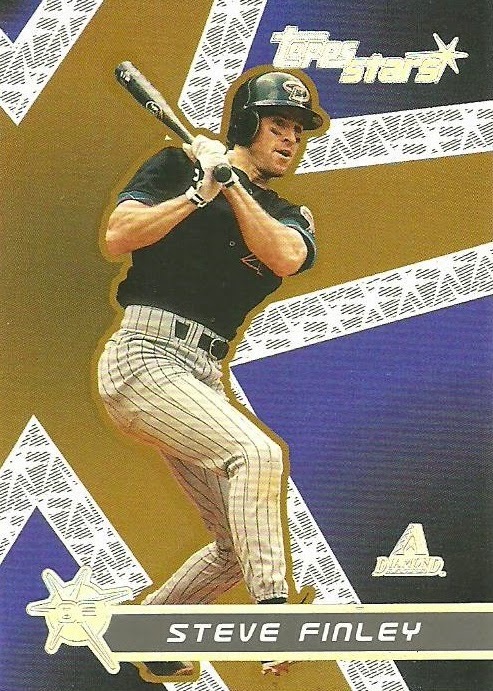 It was this 2001 Matt Williams bobblehead. 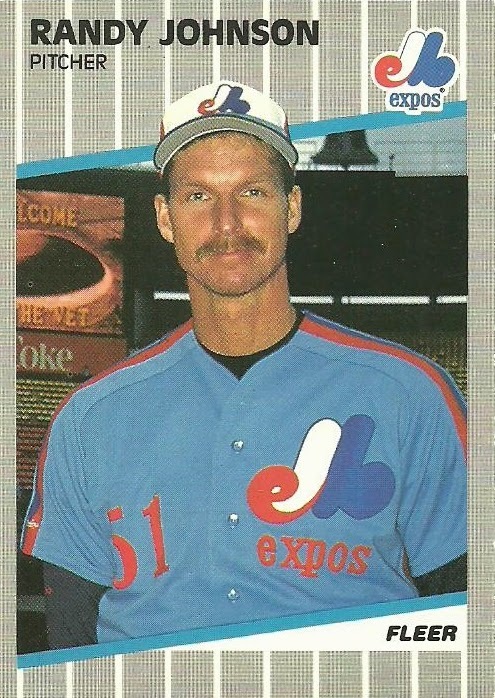 It's a nice looking bobblehead, but doesn't really look a ton like Matt Williams. 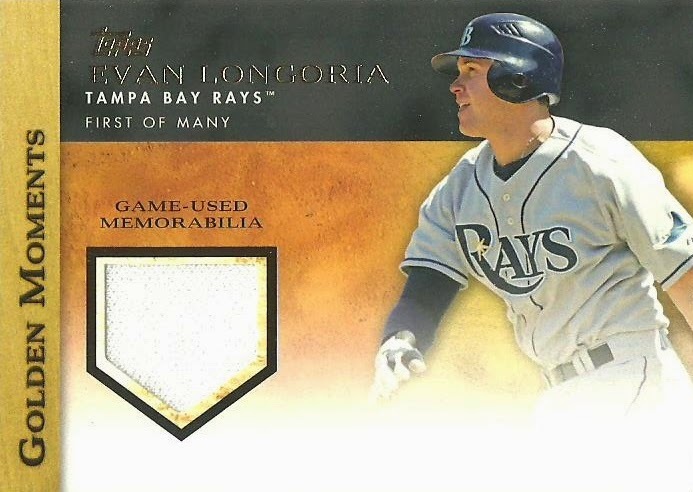 This leaves me just needing a 2008 Baxter and a 2010 Mark Reynolds (I'm bidding on one now). 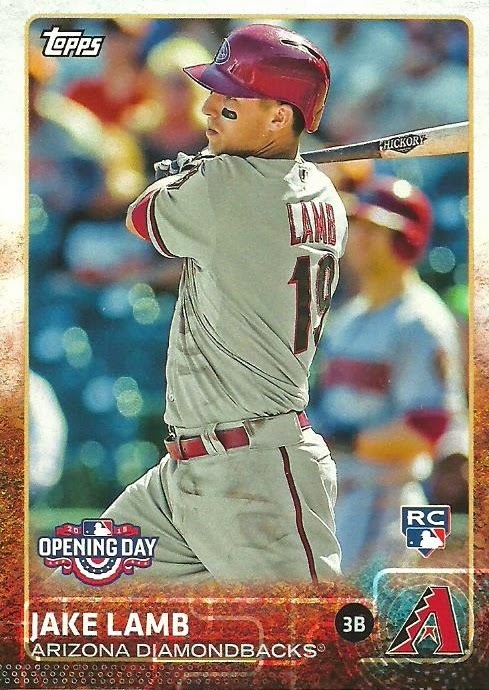 I'm going to complete the 2015 Topps set. 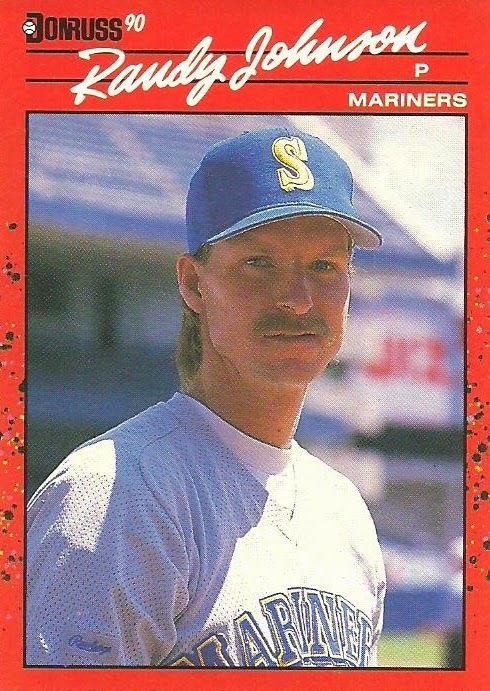 If you have any cards I still need, please let me know so we can work out a trade. Thanks! Here are the cards that I need to complete Series I. 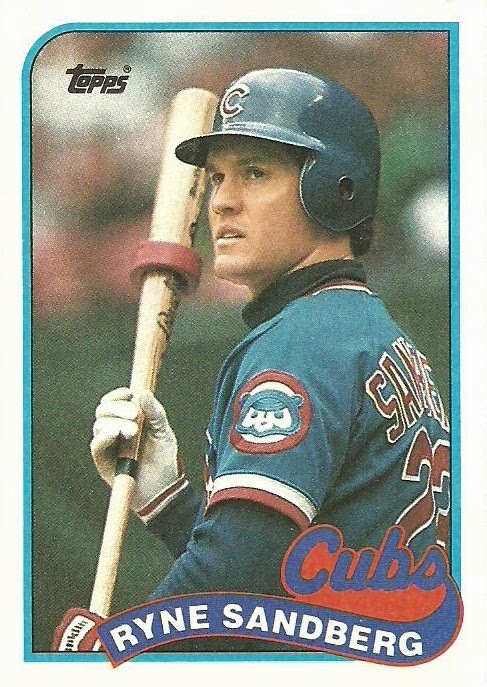 Only 41 cards to go. 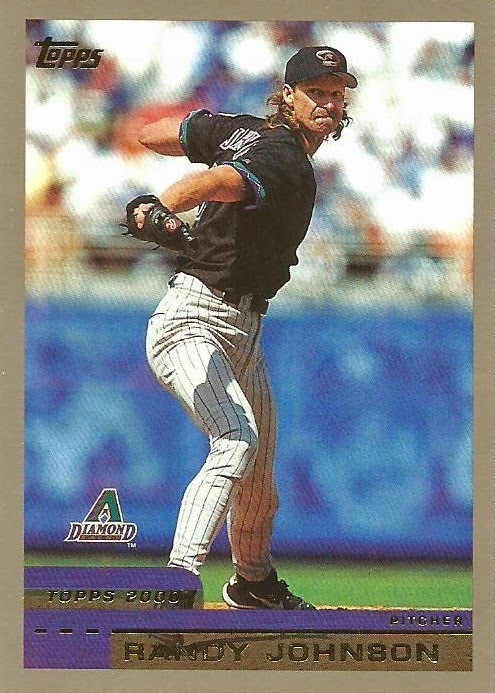 Yesterday I went to my LCS and saw that they had one of the Diamondbacks bobbleheads that I still needed up as part of their 3 PM Saturday auction. 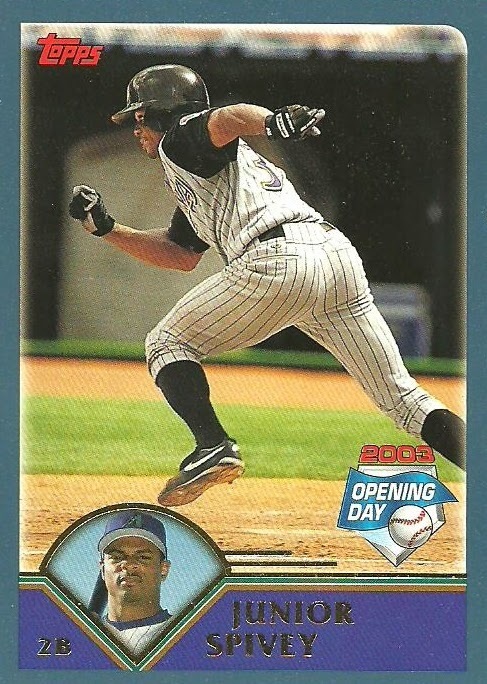 It was a 2003 Baxter bobblehead. I wrote in a $10 bid and hoped for the best because I didn't think I'd be able to make it to the actual auction. Things worked out today though that I was able to go and it was a good thing that I did because someone outbid me. The auction started at $12 and so I bid $12.50 and got it! The cheapest I've seen this one on ebay is about $25 shipped and up into the $40 range (completed sales), so I was really happy to get this one for $12.50! With this bobblehead I only need 3 more to complete my collection! That is not including the 5 that will be given out this season, but I will get those when they are given away. 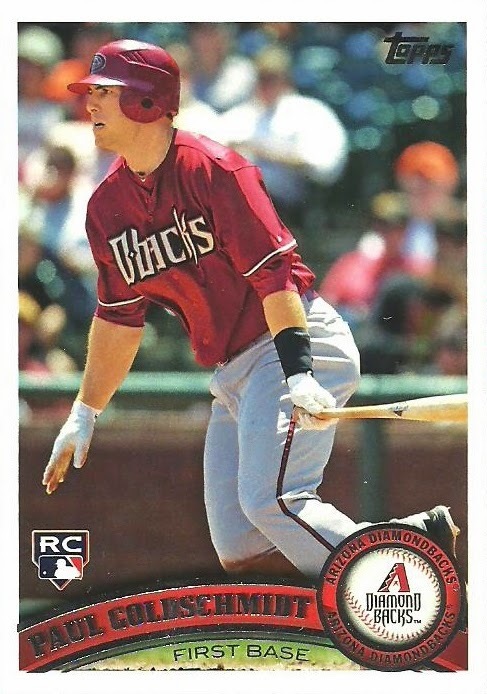 I still need a 2001 Matt Williams, a 2010 Baxter, and a 2010 Mark Reynolds. The auction was for 2 bobbleheads. I needed the Baxter and the other one is also D-Backs, but it's not a SGA (Stadium Give-Away) bobblehead so it wasn't on my list. I don't think I've ever even seen it before. I have no idea when it was issued, but it is a United Blood Services UBIE bobblehead (UBIE is the name on the back of the jersey). Like I said, it's not an SGA bobblehead, so I don't know what I will end up doing with it. 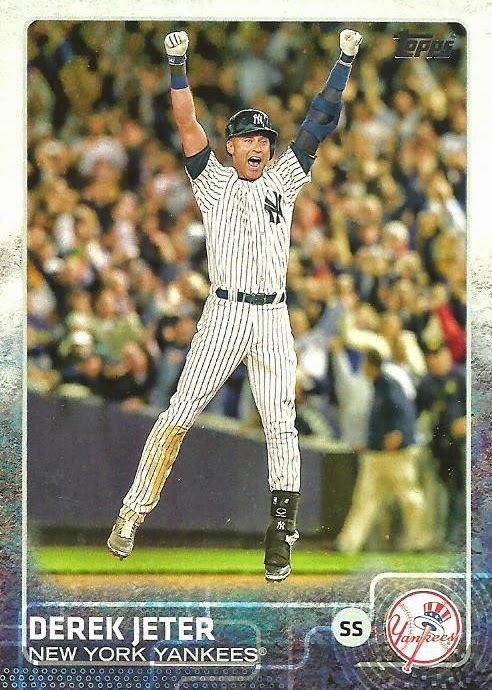 Contest over at Baseball Card Breakdown! 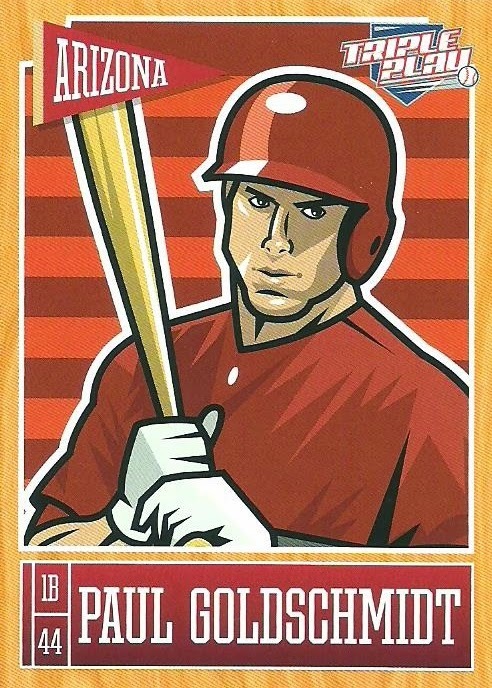 A box of cards from Hot Corner Cards!